In the seasons it was contested, the European Grand Prix has always been a somewhat odd title on the Grand Prix calendar. Instituted much more as an excuse to allow certain countries multiple races than as a national event, the European Grand Prix has travelled several places throughout the continent. Brands Hatch, Jerez, Donington and Nurburgring all have hosted the European Grand Prix throughout the years. This race has provided us with quite a few memorable moments. In 1993 Ayrton Senna amazed the world with his incredible first lap run from fifth to first in the rain, followed by a superb display of car control in the rest of the race in Donington. More freshly in mind rests a single image of the 1997 Grand Prix at Jerez, when Michael Schumacher, desperate to keep his title chances alive in the final race of the season, attempted to punt Jacques Villeneuve off the track. Between these wonderful memories, one race gets more or less forgotten. The 1985 European Grand Prix at Brands Hatch deserves a better deal than to be forgotten. It was then when Alain Prost clinched his first of four World Championships, as well as being the race that brought Briton Nigel Mansell his first ever Formula One win. Both of these firsts don't quite stand alone either. Prost's Championship was not only his first, but it was also France's first, whereas Mansell's win was the first by a British driver since John Watson won the USA West Grand Prix in 1983. Beside the race, qualifying was also a gem, with Ayrton Senna grabbing his sixth Pole of the season in only his second Formula One season. The 1985 European Grand Prix weekend started with the knowledge that Alain Prost needed just two more points to secure his first World Championship. The McLaren driver's only remaining rival in the title chase was Ferrari's Michele Alboreto. With three races to go, it was pretty sure that Prost would clinch the title, it was only a matter of where and when he would do it. During qualifying the spotlight wasn't near Prost at any time. The future champion took it relatively easy in the first session, posting a fifth time. 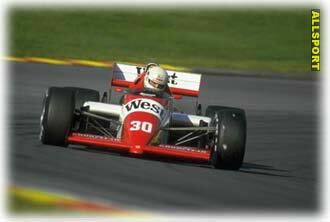 In front of him was Swiss Brabham driver Marc Surer, who ran around the track nearly six tenths faster than Prost. However, Surer's performance was outshadowed by the three drivers before him. At first Ayrton Senna posted the fastest time, despite being blocked by Ivan Capelli, who made his first appearance in the Tyrrell as a replacement for Stefan Bellof who had passed away after a sportscar accident earlier in the season. As time went by, both Brabham driver Nelson Piquet and Williams pilot Keke Rosberg set faster times than the Brazilian. Piquet was now leading with a time of 1:09.204, more than three tenths faster than the record time Keke Rosberg had set in 1982. As the session was ending, Ayrton Senna went out one more time. His final lap came like a smash with a sledgehammer in the face. As if in a different dimension, the young Brazilian flew across the track, posting a time of 1:08.020, more than a full second faster than Piquet's provisional pole. In second qualifying, Williams had peeked at Lotus and found what must have helped them driving to that incredible time. Lotus had been pre-heating the tyres in order to go have the tyres on optimal temperature sooner. Nowadays this is a common thing, but in 1985 it hadn't been done before. The Williams drivers Rosberg and Mansell indeed improved their times, but not quite enough to beat Senna. Mansell beat Rosberg by a tenth of a second, but he was 0.03 seconds short of beating Senna. However, the Williams' weren't the only cars after Pole Position. Nelson Piquet tried very hard in the powerful Brabham, but Senna responded with a 1.07.786, finding time where nobody had thought improvement was possible anymore. All of a sudden, Senna seemed beaten after all. With all of his experience and sheer speed, Nelson Piquet put in a dazzling 1.07.482, over two seconds faster than anybody circled Brands Hatch ever before this weekend. This, one felt, must beat Senna certainly. The younger of the two Brazilians had given everything in his previous lap and there was no way he could go faster. At least that was what the world thought as Ayrton Senna went out one last time in his black and gold Lotus. In a perfect lap Senna was flying around the circuit like nobody ever before. It seemed like pure magic and half way around the lap it dawned that he might after all be able to beat Piquet. However, on the way down towards Hawthorn Bend, a red and white car showed up. Alain Prost was driving back to the pits at a considerably lower speed than the unleashed Lotus. Where every other driver would have and maybe should have lifted, Senna didn't. Driving with absolute determination, he blasted past Prost. He finished his lap and a lot of jaws dropped around the world. 1:07.169. If his time of the day before arrived like a smash with a sledgehammer, this was a bulldozer being dropped on the competition. As the smoke cleared, a remarkable grid showed. 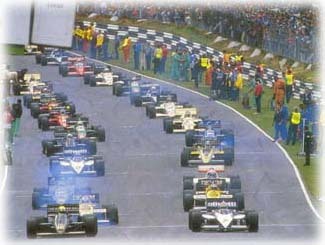 Both Brazilians Senna and Piquet were ofcourse on the first row, with the two Williams' of Nigel Mansell and Keke Rosberg lining up behind them. Surprising fifth was the French Ligier driver Phillipe Streiff. 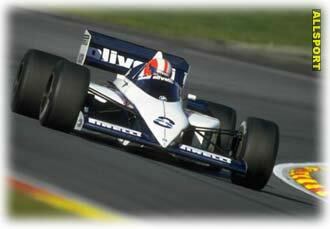 Following him were Alain Prost, Marc Surer and Derek Warwick. Much to their own desperation, both Ferrari's were well down the grid in 13th and 15th place. The only driver not to make the grid was Dutchman Huub Rothengatter in the Osella. After the first session he had been right on the tail of debutant Ivan Capelli in the Tyrrell and Pierluigi Martini in the only Minardi, but whereas his rivals improved their times by more than two seconds on day two, Rothengatter went over a second slower. At the start both Ayrton Senna and Nigel Mansell from the righthand side of the track got away well, while the other Williams of Keke Rosberg had great trouble getting off the grid. As a result of Rosberg's bad start, Alain Prost was forced onto the grass on the left side of the track to avoid putting his McLaren in the back of Rosberg's car. While Rosberg got away safely, Prost desperately struggled to regain control of his car, dropping back to tenth before the first corner. Rosberg, much to his own surprise, found himself third going into the first corner, as Brabham's Nelson Piquet had a worse start than the Finn. Into the first corner, Ayrton Senna lead Mansell, Rosberg, Piquet, Warwick, de Angelis and Streiff. Especially Warwick and de Angelis, coming from eight and ninth on the grid, made a terrific start, gaining maximum profit from the general chaos around the slow starting Williams of Keke Rosberg. Only one corner ahead, things changed as Nigel Mansell ran extremely wide through Druids, dropping back to fourth behind Piquet. Behind Mansell and de Angelis was already the second Brabham of Marc Surer who made his way past Warwick's Renault and Streiff's Ligier. At the end of the first lap Senna and Mansell had a small gap over Piquet, who in turn had some air behind him before de Angelis and Surer. Behind the top six, both Ferrari's had made up their way to seventh and eight after having started 13th (Johansson) and 15th (Alboreto). Alain Prost finished his first lap in 12th position, well behind his only remaining Championship rival Michele Alboreto. Into Hawthorn, Keke Rosberg launched his first attack on Ayrton Senna, but the Brazilian held his line and stayed in the lead quite easily. Meanwhile, Derek Warwick was passed by both Ferrari's, dropping the Briton back to ninth after his initially good start. At the end of the lap, it became clear that Warwick's sudden drop back had a mechanical reason, as the Renault driver pulled into the pits. At the top of the field, the attacks came one after the other. First Rosberg again on Senna, shortly followed by Piquet trying to get past the Flying Finn. However, neither attack resorted any effect other than allowing Nigel Mansell to catch up with the leading trio. At Surtees, Rosberg launched yet another attack on Senna's leading position. At first the Williams driver went well wide onto the dust with his right wheels, only to pull next to Senna on the left side coming out of the bend. Seemingly undisturbed, Senna again did little more than keeping his line, staying ahead of Rosberg once more. Meanwhile, the first driver to abandon the race was Minardi driver Pierluigi Martini, who spun off at Clearways after just a few laps. 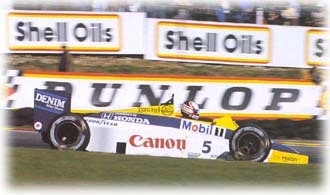 In the next lap, at Stirlings Bend, Nigel Mansell's rear end almost broke away, making the Briton drop back a few tenths behind Nelson Piquet, who was closely following Senna and Rosberg, often not more than half a second between the three. A lap later, Rosberg tried it once again, coming up side to side with Ayrton Senna coming into Surtees. Just like the other times before, Senna kept his line regardless of where his rival was. This time however, his rival was right there next to him and Rosberg's right frontwheel rubbed with Senna's left rearwheel as the Brazilian decided to brake later than late in order to keep his lead. Going into the lefthand corner, Rosberg's rear end broke away, letting the Williams slide sideways into the outside of the corner. As Rosberg was spinning round, Nelson Piquet tried to avoid the Williams, which was initially on the very inside of the corner, by going wide. Unfortunately for Piquet, Rosberg's sliding car completely blocked his Brabham. As Rosberg resumed his race, Piquet was left sitting in a motionless Brabham, ending the Brazilian's race after only six laps, as his car's frontwing and left frontwheel were badly damaged after having touched Rosberg. Rosberg, however, didn't escape the incident undamaged either. The Finn pulled into the pits with a wrecked left rear-tyre, caused by Piquet's Brabham driving into it. After a pitstop of almost twenty seconds, Rosberg resumed his race right before Senna and Mansell lapped him. This proved to be Senna's darkest nightmare, as Rosberg stayed in front of the leading Brazilian to allow his teammate Nigel Mansell to catch up. Going into Bottom Bend Senna was then passed by Mansell on the inside when the Lotus driver looked to pass Rosberg on the outside. Still Rosberg was ahead of the two, allowing Mansell by just before Hawthorn, but roughly slamming the door on Senna's Lotus, quite obviously angry with the Brazilian for the incident two laps earlier. Meanwhile, Alain Prost slowly made his way up the field again, making an important move as he passed Michele Alboreto. Slowly, Ayrton Senna then lost contact with the car he was going to lap, Rosberg's Williams, allowing Nigel Mansell to lead with a comfortable gap. Behind Senna, Elio de Angelis was third in the second Lotus, while Stefan Johansson and Marc Surer occupied fourth and fifth with the unleashed Alain Prost already in sixth place, just one place short of securing his title. Behind the more and more separated leaders, Johansson and Surer fought out a close battle, the Swedish Ferrari driver at one point even forcing the only remaining Brabham driver onto the grass. A few laps later, Nigel Mansell let his teammate Rosberg unlap himself, more or less as a token of gratitude for the part Rosberg played in getting Mansell in the lead. Then all of a sudden Ferrari driver Michele Alboreto pulled into the pits for fresh tyres, putting Alain Prost's rival in the titlechase out of competition for points at Brands Hatch. By now, Nigel Mansell held a four second lead over Ayrton Senna, with Elio de Angelis just a second behind his teammate. Almost ten seconds behind Mansell were Johansson, Surer and Prost, all three of them within one and a half seconds of eachother. To demonstrate exactly how close a battle it was, Marc Surer overtook Stefan Johansson for fourth, leaving the Ferrari driver with Alain Prost right under his rearwing. While one Ferrari was doing everything possible to keep Alain Prost from getting the fifth place the Frenchman needed, the other one had flames coming from under the bodywork. After thirteen laps, Michele Alboreto's race was done as his turbo blew up, leaving Stefan Johansson as Maranello's only weapon to keep Alain Prost from his first championship. While Alboreto's Ferrari was burning, the Italian raised quite a few eyebrows, as he was determined to drive the burning car back to the Ferrari pitbox at all costs. Eventually he made it, steering the car while standing up in the cockpit. In the mean time, Stefan Johansson and Alain Prost had gotten company of Ligier driver Jacques Laffite in the battle for fifth place. The 41 year old veteran Laffite was giving his countryman a hard time by passing him and thus demoting Prost to seventh place. At the end of the same lap, Laffite pulled alongside Stefan Johansson on the start/finish straight, taking the inside line into Paddock Bend to claim fifth place in the Ligier. Meanwhile, the Brabham of Surer, who had been battling Johansson such a short time earlier, now managed to pass Elio de Angelis to bring the Swiss driver into third position behind Mansell and Senna. Surer pulled right away from de Angelis, driving towards Senna like a man possessed. As if Ayrton Senna hadn't endured enough attacks on his position, Surer pulled alongside the Lotus driver down Pilgrims Drop, but wisely backed off before Hawthorn Bend after having seen earlier what could happen to drivers who refused to let Senna take his line. Behind Surer a blue Ligier showed up, driven by Jacques Laffite, who like his Swiss collegue had driven away from Stefan Johansson's Ferrari and passed Elio de Angelis. Ayrton Senna then got a little help from a backmarker in the person of Phillipe Aliot in the Ram. Senna passed the Frenchman on the inside of Paddock Hill Bend, but his two pursuers got stuck behind the Ram, giving Senna a little room for breathing. However, the room was only for a short time, as Surer was all over Senna's rearviewmirrors again a lap later. Only a few laps later, Surer finally got his prey as he passed Senna for second going into Hawthorn Bend once again. As Surer sprinted away from Senna, Jacques Laffite managed to overtake the Brazilian in exactly the same place as Surer did a lap before, demoting Senna to fourth place. As if matters weren't bad enough already for Alain Prost, the French driver had to come in for fresh tyres, making a longer than usual pitstop which put him further out of competition than he already was. However, while Prost resumed racing in eight place, he had a clear example behind him that his mission hadn't failed yet. Keke Rosberg, who had dropped to the very back of the field after his early colision with Senna and Piquet, had fought himself back to tenth place already, setting the fastest lap of the race in the process. First place up for Prost came as Martin Brundle's Tyrrell developed a mechanical problem, ending his race after 40 laps. Meanwhile, Nigel Mansell had nothing to worry about as he was leading comfortably with a twelve second gap to Marc Surer. Then, just four laps after Brundle's retirement, Tyrrell's second driver, debuting Italian Ivan Capelli, crashed his car into the barrier at Westfield. On the front of the field, Ayrton Senna was once again involved in an overtaking manouvre, only this time he was the one gaining a spot. Into Druids, the young Brazilian simply braked much later to pass the old Frenchman Jacques Laffite for third place. As this happened, Alain Prost was quickly gaining ground on Stefan Johansson by setting a new lap record. By the end of the lap, things had changed dramatically again. Laffite had to pit for fresh rubber, while Johansson had overtaken Elio de Angelis. This made the leaderboard Mansell, Surer, Senna, Johansson, de Angelis, Prost. The next time into Paddock Hill Bend, Alain Prost finally got the position he had been aiming for all race. 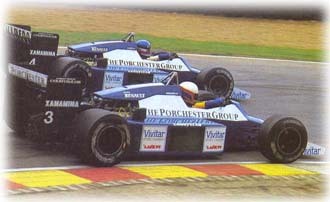 As de Angelis and Prost came up to lap Prost's one time teammate John Watson, who was replacing the injured Niki Lauda, the Frenchman came from a long way back to surprise de Angelis on the inside, while the Italian Lotus driver temporarily found himself stuck behind Watson's McLaren on the outside. Very soon things were made even easier for Prost, as the only remaining Ferrari of Stefan Johansson pulled into the pits with a terminal problem. Incredibly, Keke Rosberg, the man who wasn't even in the top 20 after his pitstop, now was driving in sixth place. Only seconds later, Rosberg and most of the field moved up yet another place, as also Jacques Laffite moved into the pits smoking. If it wasn't enough, another top six driver developed a problem as Marc Surer's Brabham burst large flames from the back of the car, ending a brilliant race in tears. With all the drivers dropping out, Alain Prost was now in third, ahead of Keke Rosberg and behind Nigel Mansell and Ayrton Senna with 13 laps to go. When the McLaren of Prost and the Williams of Rosberg ran close to the backmarkers Thierry Boutsen and Phillipe Streiff, the Finn made his move quickly when Prost was stuck behind the two. Rosberg moved into third place after a miraculous drive back up the field. Obviously, Alain Prost wasn't very eager to defend his place at all costs, since a fourth place behind the Williams was more than enough to ensure the title. At this time, things were pretty much settled. Mansell had a 19 second lead over Senna, who in turn was 40 seconds ahead of Rosberg. Rosberg and Prost were running close, but the Frenchman showed no sign of wanting to risk his title for third place, while de Angelis was fifth some four seconds behind Prost. Phillipe Streiff had been given sixth place because of all the retirements, but soon lost his spot to Thierry Boutsen in the Arrows and John Watson in the second McLaren, putting the Ligier drive back to eight. After just over one hour and 32 minutes, that was how they finished. Nigel Mansell secured his first win with an impressive gap of 41 seconds over Ayrton Senna. Keke Rosberg was the man of the race in third, while Alain Prost claimed his first World Championship in fourth place. Elio de Angelis put the second Lotus in fifth, while Thierry Boutsen just beat John Watson for the final championship point. With one of the truly legendary qualifying laps of Ayrton Senna and several battles throughout the race, this was a race weekend that kept people on the edge of their seat right from start to finish. Keke Rosberg, driven by anger, put up one of his best performances ever, helping his teammate win his maiden victory in the process. Mansell ofcourse drove an equally strong race to climb to the top step of the podium for the first time in his 72nd Grand Prix. Alain Prost finally grabbed the World Championship he had been fighting for for so long. The Frenchman's race was probably one of the most calculating, riskless races he ever drove. These positive happening were ofcourse countered by some dramatic scenes to make the picture complete. Especially Marc Surer's brilliant drive was rewarded badly in the end. From start to finish, this race had everything in it all the time. Even when Nigel Mansell was a runaway leader, the battles raged behind the Briton in this race to remember. Donington 1993 and Jerez 1997 might have boasted higher landmarques in Formula One history, but the forgotten race of Brands Hatch provided much more overall excitement and dramatics.